See all packing list posts here. Like many European cities, Prague comes alive in the summer. The days are long and warm, and everyone wants to be outside. This is also when most of the tourists come, so expected a crowded city. But no matter the crowds, the capital of the Czech Republic is a gorgeous city, and you’ll be glad you came. Watch the Astronomical Clock chime, explore Castle Hill, take a stroll across Charles Bridge, and taste some of the local food and beer. Seek out the strange sculptures by David Cerny, and don’t forget to wander away from the main square to find quiet, hidden corners of the city. I recently spent 3 days in Prague, which didn’t seem long enough. For a longer visit, consider bringing a few more of certain things, but remember you can wear clothes more than once, and you can do laundry or wash a few items in the sink to keep your packing list short. Here’s my packing list for Prague in summer. 1 pair of jeans – Or whatever pants you’re comfortable with. Summer doesn’t always mean it’ll be super hot, especially at night. Find the best travel pants for women here. 1 pair of shorts – That said, if the temperature does spike, you won’t want to wear those pants. And it doesn’t seem like the kind of place where locals think shorts are inappropriate. 1 light jacket – I was glad to have this late at night and early in the morning. My normal wardrobe is pretty casual and I’m not a dress person, but if you are, add a lightweight dress. Prague isn’t a high fashion city like Paris or Milan, and I never felt under dressed in jeans. >>Check out the female packing list for Prague in winter. It’s worth getting up early for this view from Charles Bridge. Comfortable walking shoes – Public transportation is decent, but many of the sights are in the center where you’ll be doing a lot of walking on cobblestone roads. Flip flops – Probably only needed if you’re staying in a hostel. Flats – If you want something a little nicer than sneakers or you’re packing a dress. >>Read more about choosing shoes for travel here. Pack your standard necessities, and if you forget something, Prague has all the modern stores for you to stock up. Razor – See how Her Packing List readers deal with hair removal while traveling. Makeup – Keep it minimal. You’ll just end up sweating it off. >>Learn why solid toiletries are the best for carry-on travel. Purse or day pack – I brought my REI stuff pack to use during the day. Jewelry – Don’t pack anything you wouldn’t want to lose. Camera – You’ll definitely be taking lots of pictures, so make sure you have extra memory cards. Prague has lots of great places to see the city from above. Pick one or two, like the Powder Tower, the Old Town Hall Tower, or the Petrin Lookout Tower, and enjoy the views of the city’s old buildings and the river. If you’re a light sleeper, consider staying a little farther out from the center or on the Castle Hill side of the river. The center by the main square can get really noisy, especially at night when drunk guys in stag parties are stumbling back to their hotels. 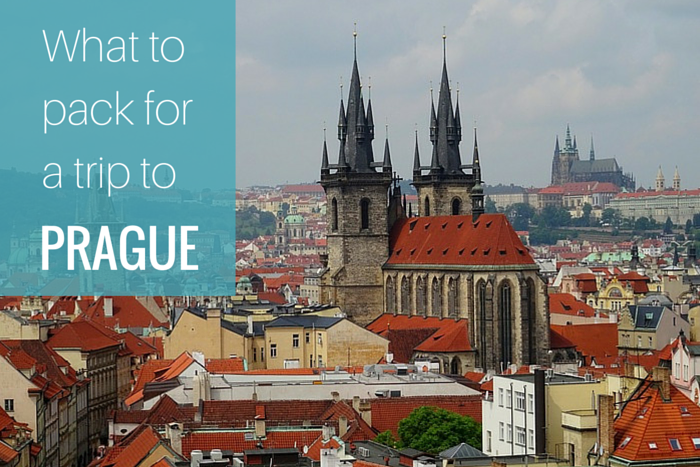 >>Read our Prague travel and packing guide here. To see Charles Bridge without the crowds, get up with the sun. My husband and I woke up early one morning and got ourselves to the bridge around the time the sun was coming up (which is before 5am in June) and there were only a handful of people out there. The sky and the clouds are gorgeous for pictures that time of day, and we didn’t have to fight with hundreds of other tourists for a good shot. Want this list in a printable checklist form? Get instant access to our Packing List Downloads Repository! Subscribe so you can download this packing list, and many more, from our repository. Success! Now check your email to confirm your subscription and get your access instructions. Ali Garland is a freelance writer, blogger, and travel addict who made it to all 7 continents before her 30th birthday. She enjoys travel planning, encouraging others to see the world, and packing carry-on only. She and her husband are expats living in Berlin. You can find Ali at Ali's Adventures and Travel Made Simple. I spent a week in wonderful Prague with my family last summer. Most days were extremely hot and dry, so light dresses and shorts with sandals were best and a sun hat necessary. We also had two very rainy days, so i would recommend bringing a compact umbrella, just in case. Definitely a good idea to check the weather before your trip! Note when I was there it was about 107 F ~ 42 C. so walking sandals that are nicer would work great for prague in the summer, rather than your typical walking shoe/flip flop/flats trio. I wanted nothing to do with socks while i was there. Also Hostel Recommendation: Prague Post Hostel, unlike the ones in the center of town which are dirty and part of a ring held by the same owner. this is nice new affordable, and close to public transit. the staff is better, everything is better and its worth the 5 min extra walk everyday. plus they have a kitchen which will save you money.